Many people play golf simply because it is good fun but if you take it a step further and enter competitions at your local club not only will you learn more and gain more confidence but you will make many new friends. It may sound daunting but although golf can be very serious competitions can also be great fun and take many different forms. This section explains about 15 different types of competition but also gives specific advice on how to enter your first competition. 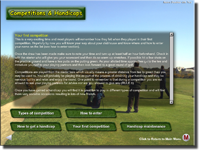 To play in competitions you need a Handicap, this section explains how to get and maintain one.